There is a psychological factor in being near the tube – you feel connected with the rest of London. Everyone knows that if you have a property near a tube station then your property is not going to remain empty for long and you will be able to sell the property swiftly. So knowing where the next tube stations are going to appear can be a very good for your wealth. All the following areas are proposed tube stations for completion within the next 5 years and therefore I consider them all hotspots. All these areas are Category A hotspots as they will undoubtedly return you a yield and a capital growth above the national average over the long term if you get in there early enough. Bishopsgate East London In the heart of the city. Unlikely to be many residential opportunities. Hoxton East London Starting to smarten up. Very popular with young professionals and arty media types. Haggerston East London Little known area. Some bargains to be had. A bit shabby though but should all change within 10 years. Dalston East London Bordering Stoke Newington & Islington – this has to be worth a punt! Canonbury East London Next to Islington Green. Pretty location with properties already fairly expensive. Caledonian Road & Barnsbury East London Currently a tucked away little known place but this will really put the place on the (tube) map! Lots of conversions in to flats. Camden Road East London See section on Tufnell Park. Primrose Hill East London Considered a village by some and again is not cheap. Plenty of 1 and 2 bed conversions available. South Hampstead East London The famous Hampsteads – always a safe bet. Kilburn High Road East London Shabby high road thus there will be renovation bargains to be had here. Brockley East London Slowly being discovered. Still affordable. Near Lewisham. Honor Oak Park East London Again, this area is smartening up. Prices start from £75,000 for a studio with yields going up to 10%. Forest Hill East London Cheap flats here. A lot of ex-council flats to be had and newer flats at prices sub £100,000. Sydenham East London A mixture of very nice homes as well as council homes. Considered by many to be an upward moving area. Be quick! Crystal Palace East London Something great is going to replace the burnt out Crystal Palace which will bring fortunes to the area. Penge West East London Great High St and with already good train connections (being Penge East and Penge West). Anerley East London Lots and lots of flats for sale again at sub £100,000 which will mean only good healthy yields. Norwood Junction East London Another place smartening its appearance. Bargain properties to be found if you get in before the full regeneration. West Croydon East London True suburbia. Croydon has that distance to be considered out of London but yet its going to get a tube. Should be popular with people who already live in Croydon. Queens Road Peckham East London Probably has one of the worst reputations for crime and poverty. This area is for our real risk takers (like me!) where prices are unfairly low and the only way is up. Peckham Rye East London Nicer part of Peckham with more of the older properties here. Choose this part if you’re not brave enough to go for Queens Road. £260m going into this place for new low rise blocks, CCTVs and job creation. Tulse Hill East London Next to (now trendy) Brixton. Very reasonable prices and surprisingly quite picturesque. Streatham East London Real up and coming area over last 3 years due to proximity and affordability. The tube station will only fuel the property prices higher. I suspect the prices will match those of Brixton. Tooting East London Smart pockets of nice properties available. Expect to pay fair prices as demand for properties is high. Heydon Road East London Getting better. No community sense here and high turnover of residents. Should provide cheap properties but be careful of voids prior to the station opening. Thames Wharf DLR A station on the vacant Thames Wharf site will not be constructed as part of the initial scheme because development of the site is restricted by the safeguarding for a potential river crossing. However, the route will allow the opportunity for a station in the future when the site is developed. West Silvertown DLR A station at West Silvertown (between the current entrance to Plaistow Wharf and Knights Road) will serve the existing residential development at Britannia Village and the former Tate & Lyle site known as Peruvian Wharf. A pedestrian crossing will connect the station to the residential area on the north side of the road. The station entrance will be close to local bus stops on North Woolwich Road. Ponton Dock DLR This area is subject to major redevelopment and regeneration, the first phases of which are now complete including the Barrier Point residential development and new Thames Barrier Park. London City Airport DLR No investment opportunities here. 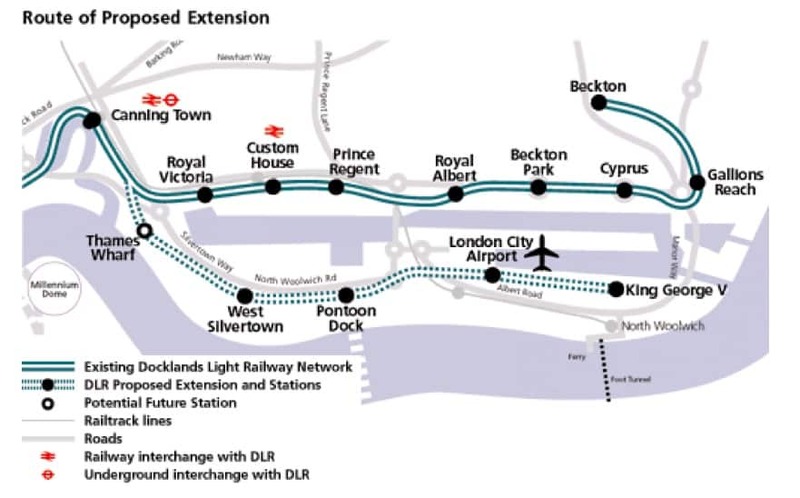 Typical journey time from London City Airport station to Bank will be 22 minutes, Canary Wharf in 14 minutes, and to Stratford via Canning Town in 12 minutes. King George V DLR The station at King George V will be built at ground level to the northern end of Pier Road. 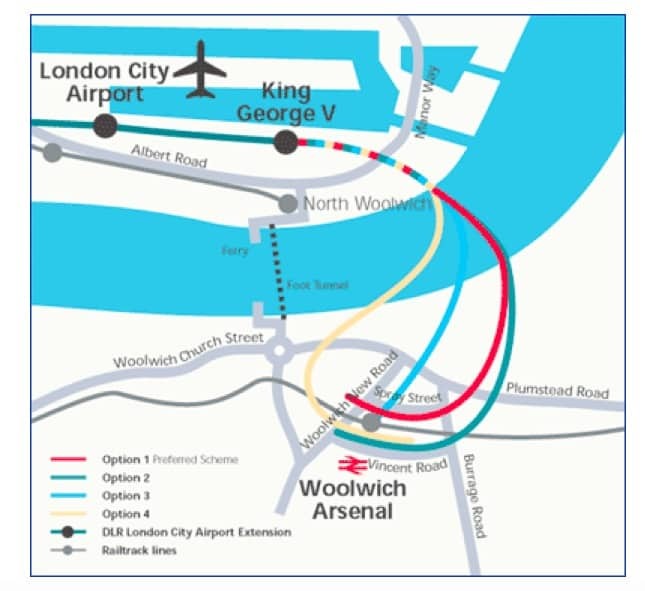 This station will be located conveniently for local shops and direct pedestrian links to the ferry/bus terminal at North Woolwich. Woolwich Arsenal DLR Great north-south link. Located on Vincent Road. Check out properties on this road. Should yield a good long term return overall.